• Prices may change, without notification, at any time; please contact Davis Chevrolet to confirm pricing and availability. • Prices do not include GST, EHC or any applicable taxes, fees or core charges. • All prices are 'each' unless otherwise specified. • Product may not be exactly as illustrated. The best value crate engine in the GM Performance Parts lineup! 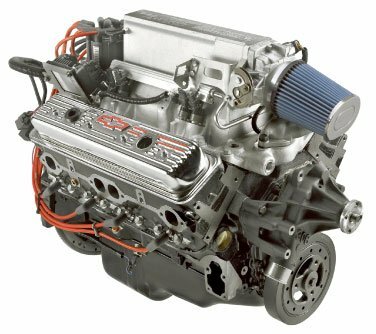 The 350/290 HP is the most popular GM Performance Parts crate engine because no one can deliver such performance for this kind of value. GM Performance Parts believes that everyone should be able to afford a high quality, high performance GM V-8 without going broke. The 350/290 is an answer to those car crafters who demand maximum return on their money. However, just because it's affordable, don't think that it's a stone. The 350/290 delivers 290 hp @ 5100 rpm and a solid 332 lb.-ft. of torque at 3750 rpm. With those kinds of numbers, it's the perfect replacement engine for the millions of GM vehicles that shipped with a small-block. Got a tired, old project car that needs a lift? This is the crate engine for you. We've also loaded the 350/290 with a four-bolt main bearing block, aluminum pistons, and a hydraulic camshaft. 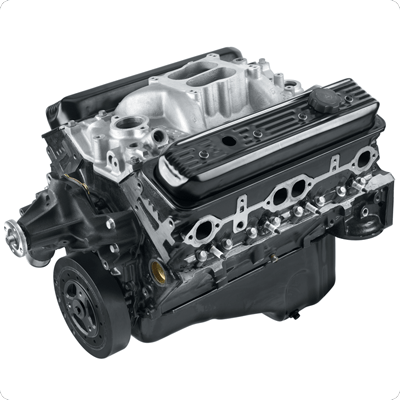 The cast iron cylinder heads are designed to be extremely durable while still providing good airflow through the engine. The 350/290 will ship to you as a Base-level long block. Add an intake manifold, carburetor, ignition system, starter, and balancer, and you'll be ready to hit the road with a fresh new motor. All of these parts are available from GM Performance Parts, and with its low price, you'll have no problem finishing off the 350/290 in style. A 350 that's been stepped up in power! 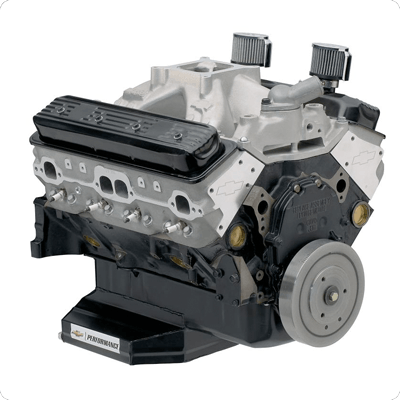 You won't go broke finishing off your project car with our 350 HO Deluxe crate engine! It's packed with all the features you need to get a reliable 330 horsepower and 380 lb.-ft. of torque from a dependable, time-tested combination of GM Performance Parts. Of course, all of the components used in this engine are brand new – not re-manufactured parts like the competition is trying to sell you. Designed by our in-house engineers to give you maximum return for your hot rod dollar, the 350 HO Deluxe is a great choice for your small-block crate engine needs. The 350 HO is based on a tough, Chevy four-bolt block that holds a strong nodular iron crankshaft, good rods, and aluminum pistons. The high-lift camshaft gives the engine its own unique, aggressive idle. The cam is based on the same one found in 1965-67 Corvette 327 engines, but it has even more lift and duration. Complete from top to bottom, the 350 HO comes pre-assembled with the intake manifold, carburetor, and distributor. The perfect choice for a hot rod. GM Performance Parts’ unique Ram Jet 350 combines the classic look of the original Rochester mechanical injection system with the dependability and optimized performance of contemporary electronic port fuel injection. We’ve taken our proven 350 Small-Block and topped it with an exclusive port fuel injection system that emulates the look of Chevy’s factory fuel injection systems from the 1950s and ’60s. It’s the perfect choice for a resto-mod hot rod from the original Rochester era. 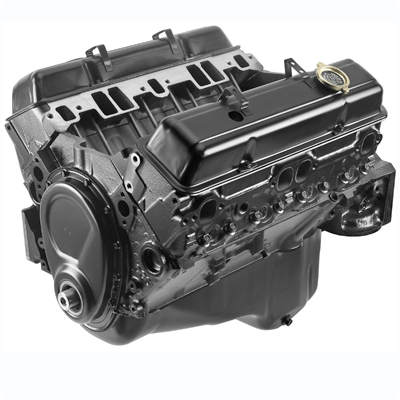 The bottom end of the engine is our stout 350 with a brand-new block, a hydraulic roller cam, Vortec iron heads and a pump-gas-friendly 9.4:1 compression ratio. Extra Cubic Inches Deliver Greater Torque For Your Truck! Got a pre-1980 GM truck with a tired Small-Block? 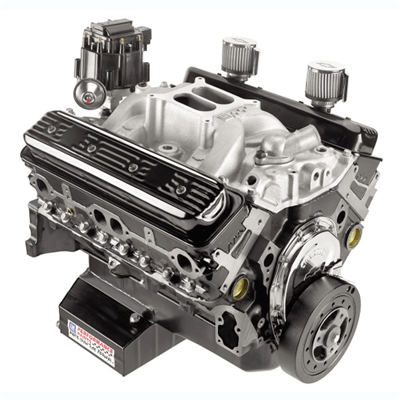 Forget the rebuild or reconditioned used engine and take your trusty truck’s capability to the next level with our big-torque HT383 stroker crate engine. Its extra displacement and unique parts are designed to build a wide, flat torque curve that hits the 400 lb.-ft. mark by 2,500 rpm and doesn’t dip below it through the 4,000 rpm peak (435 lb.-ft.). It also makes 340 horsepower. That’s power and torque you simply won’t get with a stock-type rebuild! The HT383 features a brand-new engine block with four-bolt mains – an upgrade for most production engines that came with two-bolt mains – along with a forged steel crankshaft and a smooth hydraulic roller camshaft. Its 9.1:1 compression ratio allows it to run on regular unleaded gasoline, too. We deliver the HT383 with an aluminum intake manifold, ready for you to swap over the accessories from your tired engine. It’s also backed by a 2 Year/80,000 km limited warranty. IMCA Racers-Call For Special Pricing!! 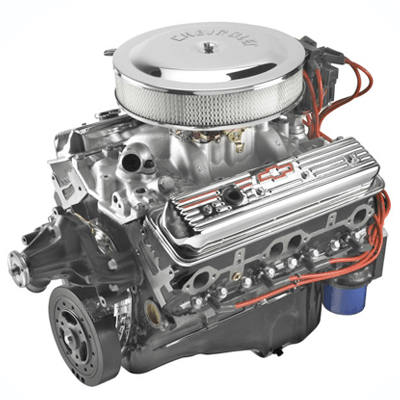 Chevrolet Performance's CT350 delivers 350 horsepower from a classic 350 cubic-inch combination. It’s just the thing budget-conscious racers can depend on for competitive performance and low-maintenance durability. The CT350 is based on the popular 350 HO high-performance street crate engine, including a stout four-bolt-main block and Vortec-style iron cylinder heads. The Vortec heads and unique dual-pattern camshaft help deliver more than 300 lb.-ft. of torque at 2,000 rpm and hold it above that mark through 5,500 rpm – it peaks at 390 lb.-ft. at 3,800 rpm. With that much pulling power, you can hold a gear longer, keeping the engine in its sweet spot for quicker laps. We complete the CT350 with an 8-quart Circle Track racing oil pan, balancer, HEI distributor and an aluminum high-rise, dual-plane intake manifold. 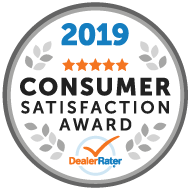 Add your carburetor, starter, spark plugs, wires and water pump – all available at Davis Chevrolet GMC Buick’s parts department – and you’ll be ready to roll into the winner’s circle! Available Officially Sealed For IMCA Modified Racing - Call For Special Pricing! We’ve added greater high-rpm durability to the CT400 racing engine with new Fast Burn heads that feature beehive-type valve springs and complementing valvetrain components. The beehive springs enable greater high-rpm performance and durability. They allow the engine to rev higher to make the most of every cubic inch of air drawn through it. This brand-new, factory-sealed racing engine is based on the new ZZ5 street crate engine, but includes a racing-only 8-quart circle track oil pan, with dual kick-out design, along with a valve cover breather kit. The new, lightweight aluminum cylinder head casting – distinguished by new Bowtie logos cast into the ends – is based on the proven Fast Burn design, with large intake runners and 2.00/1.55-inch valves. The CT400 racing engine has a tough bottom end, anchored by a forged steel crankshaft and hypereutectic pistons installed in a brand-new block with four-bolt mains. The assembly also includes an open-plenum high-rise intake manifold and 1.5:1-ratio aluminum roller rockers. Put a “fast burn” on the competition – with greater high-rpm performance than ever before!